Circus Couture Balloon Dresses feature artist Tawney B! Circus Couture is a truly magnificent project. It’s a once a year show featuring variety acts, a fashion show, and a really exciting live auction. The production value of the show rivals anything on the Las Vegas Strip, and all of the proceeds go to an amazing charity. This is some of the best live entertainment you will find in the world, and to top it all off, all of the proceeds go to pediatric care and research. Tawney was invited to be the featured designer for the fashion show this year, which was really exciting! 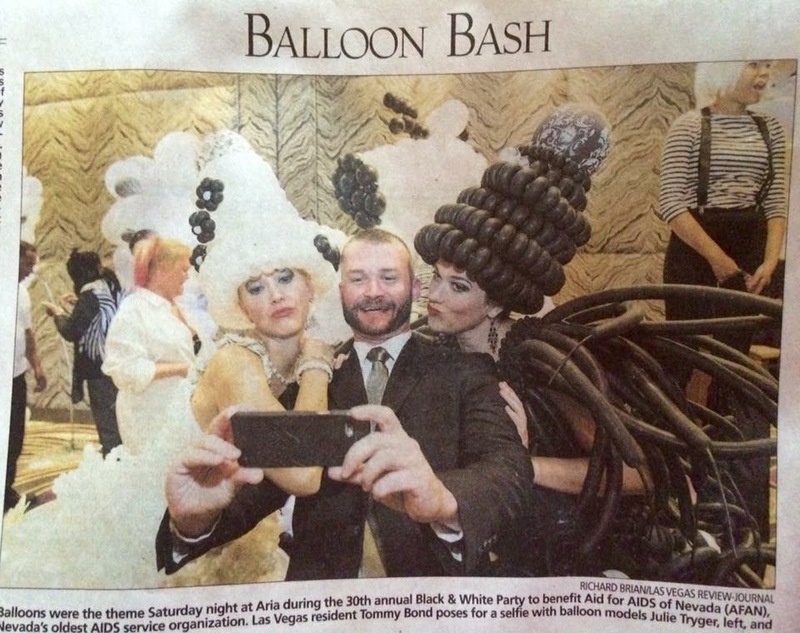 The concept was to make a balloon dress that represented each of the themes from the previous themes. This meant there would be five unique balloon dresses. 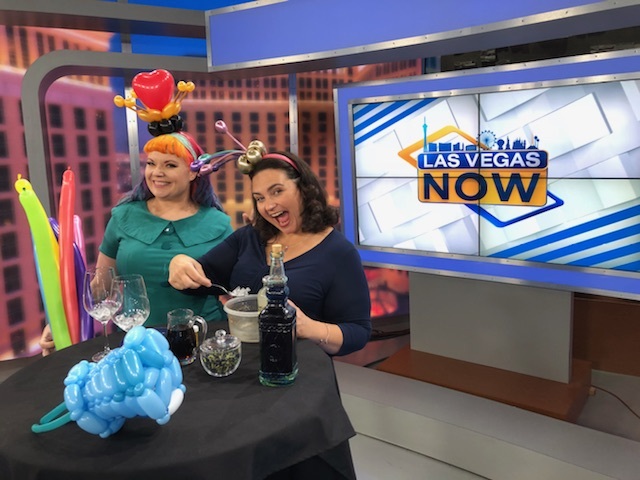 We knew we wanted to make these all really spectacular, so we put together a power team of Tawney, Shana Brenion, and Buster Balloon. The three of them created these five, beautiful works of art. The first theme was Incognito. We decide to go with a Masquerade dress for this one. Modeled by Erica Comperoni, the dress was a collaboration of all three designers. The bodice was created by Shana, the skirt and mask by Buster, and the detailing on the shoes, and boa were made by Tawney. Detailing on the shoes and the mask were made using non-inflated balloons with wire in them to form the desired shape. For year two, the theme was Revolution: “We are the army in the fight against pediatric cancer.” This dress was designed by Shana Brenion. In order to achieve the exact shade of green she wanted, she used a technique called double stuffing. 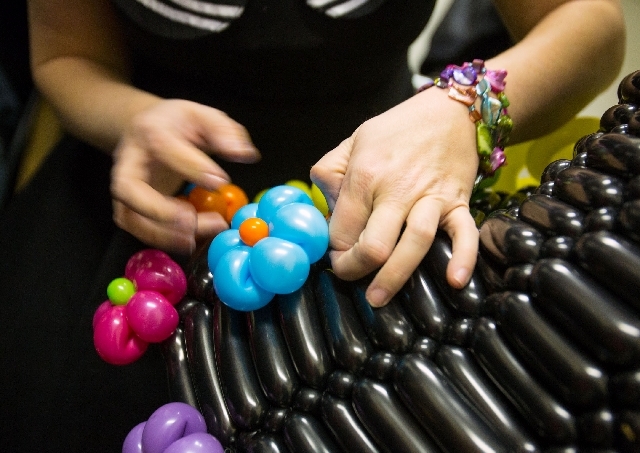 This involves sticking a balloon inside another balloon, then blowing them both up together. It allows the artist a greater pallet of colors. Year 3 was 86 Peculiar Place. 86 Peculiar Place is the address of a realm where all creatures, too bright, brilliant, colorful, or strange for our world go to live. Tawney designed this dress using rainbow balloons to add to the colors of the balloon dress. Modeled by Julie Trygar, Tawney B. used over 500 balloons to create this peculiar balloon dress. Possessions was the theme of year four. This was all about the objects we possess and the things that possess us. Buster Balloon created a long flowing skirt by tying round balloons together. Buster and model Erica Van Lee take a moment to pose together. The current year’s theme was Unlocked. This one was all about locks, keys, and doors. All things that can be secured or set free. Tawney made this dress with help from Shana on the detailing. The large skirt of this dress was stuffed with helium balloons. When she removed the skirt or “unlocked” it, the balloons were set free and floated to the ceiling. The underskirt and fishnets were all made using non-inflated balloons. The dress was modeled by Corina Smith. The large skirt was stuffed with helium balloons which were released when the skirt was removed. I would just like to thank everyone who helped, modeled, organized, and fed us while we were working on these Circus Couture balloon dresses! Next post Cool St. Patrick’s Day Outfit!